The sounds and styles of internationally acclaimed vocalist/composer Jocelyn Medina cross cultures, creeds and continents. Her original work fuses elements of world music with jazz harmonies, neo-soul/funk grooves and adventurous improvisations delivered through compelling lyrics and a distinct sound. 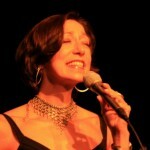 Whether from the stage of an international festival or in the intimate setting of a small jazz venue, she seeks to touch on each listener’s individual experience with messages of universal truth and a unique artistic approach. The band: Jocelyn Medina-voice & compositions; Rez Abbasi-guitar; Zack Lober-bass; Paul Wiltgen-drums. Please join us for an exciting evening of music when Jocelyn and her quartet perform at the Ink Well Cafe, 408 Rogers Ave, between Lefferts and Sterling.